Italy has arrived in California. 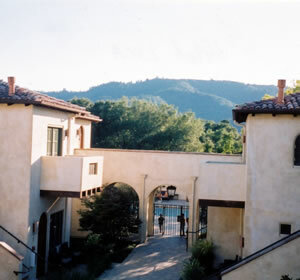 Let me be more precise: a luxurious and tasteful version of a Tuscan villa has been erected in the Napa Valley. 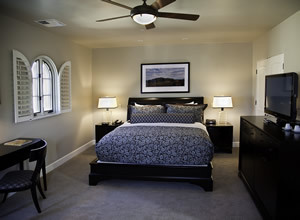 On Washington Street, in the pretty town of Yountville, there is now a small hotel with a wonderful pedigree. It is the brainchild of David Fink, one of the most accomplished hoteliers I know. With antique materials – like the 200 year-old roof tiles from Lucca, in Italy, and the old wooden beams from the mid-West – a hostelry has been constructed which will delight all those of us who love both Tuscany and the Golden State. 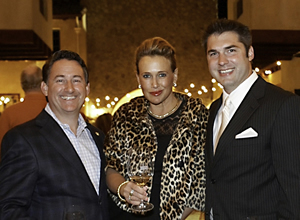 The interior design, by Kathleen Fink (pictured, with David Fink on the left and the hotel manager, James DeLuca, on the right) is a brilliant confection of elegance and luxury. And the hotel’s restaurant, the Cantinetta Piero, is serving Italian food of a high order. Yes, you have guessed: the Hotel Luca has won me over. In my hired Cadillac, I had driven from Carmel – a tiring journey even in so comfortable a motor car. I turned into Washington Street and found that my destination was only a few steps from The French Laundry (see separate article), the restaurant of Thomas Keller which is famous throughout the civilized world. The hotel is on the opposite side of the road and, architecturally, is a notable addition to the attractions of the town. But my building inspection was postponed. I needed a cup of tea. And that is what I was soon enjoying – the finest Earl Grey, poured into a porcelain cup – in my billet. Room 30 (check the rate for specific dates) was on the first floor, and reached via an outside staircase. The hotel has only 20 rooms (plus two residences, for long stays), but I would recommend the first floor rooms to you, for mine had both a private outdoor space (a solid balcony reached through a French window) and the privacy (and abundance of natural light) of being on the upper floor. It was clear to me at once that a great deal of thought had gone into this accommodation. Kathleen Fink is to be congratulated on achieving such a high level of comfort and convenience in a new building. And the bathroom was just as good, with heating under the limestone floor, handmade glass tiles, a walk-in shower, a large tub, 2 wash basins, a loo and large white towels of the best quality. And again, there was the attention to detail, for the shaving mirror (on an extending arm) was positioned perfectly. 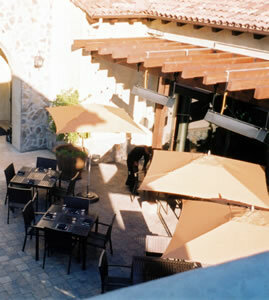 The hotel’s dining room is the Cantinetta Piero, which is on the ground floor to the left of the entrance. 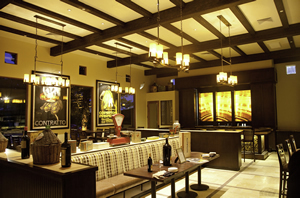 Its menus are inspired – of course – by the food of Tuscany, and its breads and pastries are baked daily in its own ovens. It is a popular place and can therefore be rather noisy. I wondered where I should sit for dinner, but a vivacious young lady from Rome came to my rescue. She was Caterina Mirabelli, the Restaurant Manager – who arranged for me a table in the pretty courtyard, away from my animated fellow diners. 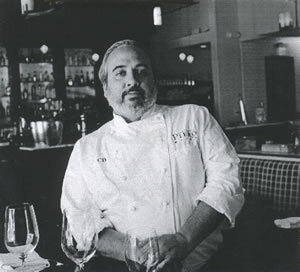 Here, in a supportive armchair, I sat back as the waiters in open-necked black shirts brought to me dishes from the kitchen of Chef de Cuisine Craig di Fonzo (pictured). Around 200 wines are offered on the list, all of them (except the rosé champagne) from Italy or California. Prices range from $27 for a negroamaro from Southern Italy to $950 for Mr Gaja’s 2005 Sori Tildin nebbiolo from Piedmont and $825 for the 2004 Harlan Estate meritage from the Napa Valley. There are 7 vintages of Ornellaia (with the 1998 at $450) and 6 vintages of Sassicaia (with the 1998 at $286). Sommelier Paul Robinson brought me a glass of pecorino from Abruzzo, which had discreet fruit and well-balanced acidity (Umani Ronchi, 2008 - $14, glass), and a bottle of full-bodied, fruity Napa Valley cabernet (Martin Estate, Bacchanal, Rutherford, 2006 - $83). I returned to the same outside table for breakfast each morning. On these occasions the waiter, Eric, rushed about purposefully to ensure that my coffee cup remained full – while I, at my usual measured pace, consumed freshly squeezed orange juice, yoghurt with granola and poached eggs with smoked bacon. All of these were of good quality. On one morning, a slight chill came into the air, so I took my concluding cappuccino over to one of the sofas next to the outside fire, and there scanned the San Francisco Chronicle until the rays of the sun crept onto my brogues and I knew it was time to wander back past the fountain to my room. There I sat and pondered the question of the day – whether to venture out among the vineyards in the Cadillac or to settle in a chair by the swimming pool and read and doze alternately. With such important decisions were my days measured out at the Hotel Luca. And that was right, for I had found Tuscany in California. 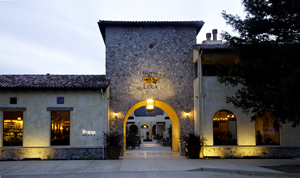 6774 Washington Street (between Madison and Pedroni), Yountville, California 94599, U.S.A.